Game of Thrones season premieres are always a mixed bag to watch and review. Season openers tend to catch viewers up with what’s gone down thus far and how the relationship dynamics have shifted or solidified. In that sense, they often tend to be a bit underwhelming in that no significant plot developments or revelations occur. Then again, the mere feels of watching a new Game of Thrones episode that’s not a rewatch of anything you’ve seen before ignites a new thrill, making us a bit biased as both viewers and reviewers when evaluating the episode on its merits. The Season 8 premiere is no different. It abounds in callbacks to prior seasons and catches us up on what the status quo is in the North (which is where all the action is now). At around 54 minutes, which is the standard length of a Game of Thrones episode, Winterfell (until yesterday, the episode didn’t have a name) packs in quite a lot given that it has to deal with the fallout of Season 7’s seismic narrative shifts. It helps that with characters reduced and consolidated, we’re left with just two locations to hope around, a fact reflected in the updated intro that takes us to the interiors of these locations rather than covering areas around the world that don’t matter now. Primarily though, the episode centers around reunions, particularly those of the Starks, and it’s a profound moment for not since the Season 1 premiere Winter is Coming have all of them been together. The callbacks to earlier seasons are well done and should give fans a bit of nostalgia to meme around with. They begin right from the first scene when the new King and Queen (self-proclaimed for now) march toward Winterfell along the Kingsroad that echoes the Season 1 opener where Robert Baratheon marched to Winterfell to recruit Ned Stark as his new Hand. Arya’s enthusiasm back then has transformed into a stoic stance with subtle displays of excitement, hatred and then again excitement upon seeing the dragons, her childlike demeanor taken over instead by a small farmboy who climbs atop houses to catch a look at the oncoming cavalry. While not a shot for shot recreation, the entire sequence has the Season 1 feels, and even uses the exact same lifting score Djawadi composed back then for the situation. Among the more heartwarming reunions are the ones that Jon shares with each of the siblings. With Bran, he kisses him dearly on his forehead echoing their Season 1 interaction yet again, but is a bit taken aback when he fails to get any reaction from the now reticent Bran (Sansa and Arya would know; they got used to it last season). With Sansa, it’s a second reunion since he departed for Dragonstone in the Season 7 episode Stormborn and goes about as you’d anticipate, with Sansa being wary of the new Queen. 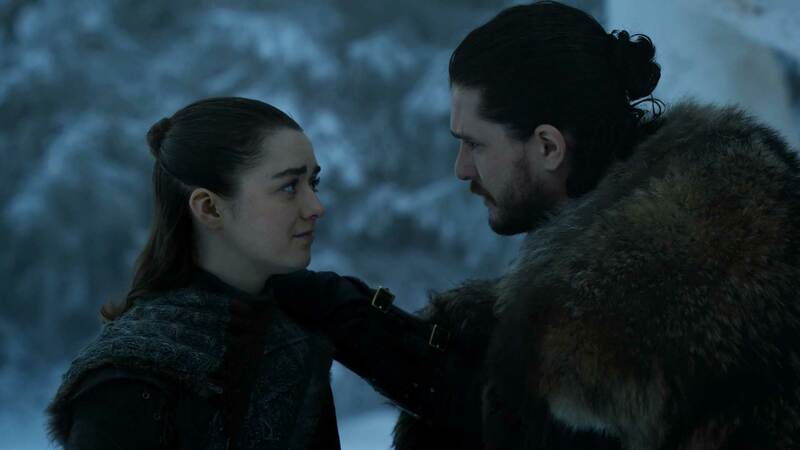 With Arya, his reunion goes somewhat as expected although there’s an undercurrent of tension seeping through when Arya sees that Jon has bent the knee to a Targaryen. In a small but important moment, he ignores Arya when riding toward Winterfell, which she takes for Jon ignoring the Stark house now that he’s on the dragon-queen’s side. In fact, that’s the other challenge the writers have – to get everyone to accept that their King in the North Jon Snow has sworn allegiance to the Targaryen Queen Daenerys. Naturally, they do not take it well, with some (House Glover?) withdrawing support, preferring to wither out their winter in the confines of their homes. Jon tries his best to get everyone to think rationally about the real threat and how titles and houses and lordships do not matter anymore, but the older houses won’t listen. It would probably take a few episodes worth of convincing to realistically have them put aside their differences and fight and it would’ve been a great few additional hours, had we gotten any. And that’s where the cracks in the episode start showing up. Having shortened the season’s run to a mere six episodes (with one dedicated to a big battle), there just isn’t enough time to let the interactions and plot machinations play out a natural course. Where older seasons took their time in rewarding viewers with the payoff so that the payoff, when it came, mattered and resonated big time, we’re now just being thrown revelation after revelation to get on with it and move on to the next thing. It’s telling that two of the most anticipated, most theorized plot points come true in a span of minutes as not only does Jon learn of his true lineage, but he finally rides Rhaegal the Dragon to the Waterfall where he made out with Yggritte. Jon riding Rhaegal, while a soaring moment in terms of visuals and score, does have a bit of cringe to it. It looks far detatched from traditional Thrones and resembles traditional TV heavily in ways that you probably can’t quantify, yet sense it if you’ve watched countless mediocre TV Shows. That isn’t to say it’s a highpoint; pretty sure it’s going to come into play in future episodes, but rushing to the outcome dilutes it of its momentousness. It’s also one of the first original pieces of composition we hear from Ramin Djawadi for Season 8 and a good one too; pretty sure that was an original theme he composed for the said moment that should be used in at least one future episode. Fortunately, the episode does feature some delightful sequences and the best amongst them is, rather suprisingly, Sam’s interaction with Daenerys and Jorah where he slowly learning about the fate of his family, the male Tarlys who Dany burnt in the Season 7 episode Eastwatch since they refused to bend the knee. It’s a moment of few words but lots of interplay among the eyes. Iain Glen silently shifts his gaze to Dany who goes from happiness at Sam having cured Jorah to regret / sadness followed by for what she’s done. But the best performance by far comes from the underrated John Bradley who masterfully goes through the entire gamut of emotions from delight to disappointed (yet respectful) to broken to angry all in a matter of a few seconds. The scene is handled to great effect by David Nutter and elevated by great acting and is one of the few bits in the episode that remind you of what Game of Thrones is capable of when it’s in top form. As much as it’s unlikely, I really hope Bradly has a shot at an Emmy nomination at the very least. Sam however still has a role to play as he’s the one who reveals Jon’s true lineage to him. This is where the other great scene of the night comes and while not as strong as Bradley, Kit Harrington channels his inner turmoil upon learning that he’s really Aegon Targaryen VI. For Jon, the horrifying truth is an indication of his father having essentially lied to him the entire time, even if it means to protect him from then king Robert Baratheon. Harrington displays a dismayed look that quickly turns to frustration and a tinge of anger and possibly even horror as the relationship he shares with Daenerys sinks in, something which should play out interestingly over the next few episodes. That it comes under the crypts of Winterfell with Ned’s statue watching over him further underscores the moment. There are a few other reunions as well which result in some more callbacks to what the characters have been through in the past. Arya meets both the Hound, who she left to die back in Season 4 and Gendry, who she departed ways with in Season 3. Notably, Arya is the only one who’s undergone the strongest journey and comes out as a different, upgraded version of herself when interacting with these two. The Hound must surely be proud; Arya’s current self began signs of showing up in his stead. Tyrion and Sansa share a heart-to-heart as well while reminiscing about old weddings and it’s a welcome change to see Sansa being the smart one here, even smarter than Tyrion who for once is taken by emotions concerning his family when once it was the other way around. By contrast, King’s Landing feels relatively empty. Cersei is trying to play Euron but he just keeps getting her what she wants. In a shocking development, she agrees to sleep with Euron and from the looks of it, will trick him into believing he’s giving him a baby. It feels a bit odd for Cersei to sleep with someone other than Jaime and I think she realizes that as well leading to her tearful reaction. Either that, or she’s mighty disappointed on the Golden Company’s Harry Strickland not bringing Elephants. 20,000 men. and 2,000 horses but no Elephants. 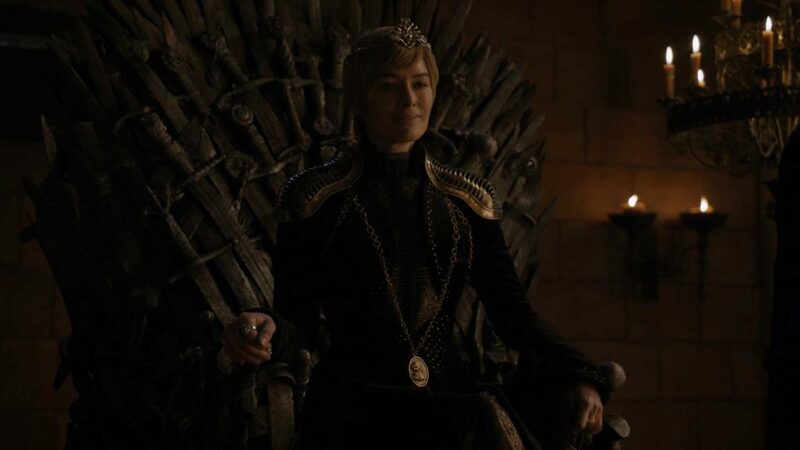 I cannot help but relate to Cersei’s dismayed look upon hearing that; she reacted pretty much how the audience would. The writers either intended that, or hope for this to be a bigger setup when Elephants to show up in later episodes. There’s some stuff with Tormund, Berric and Eddison Tollet (they survived the Wall collapse) that’s part-horror and part-humor. For the most part though, the writing has indeed taken a noticeable dip from the days of the sharp textured dialogue that Game of Thrones used to be laden with and is instead now packed with strong narrative developments with really thinned out conversations. Most of the back-and-forth features developments we’ve seen occur over the course of these seven seasons; gone are the days when characters would launch into monologues about past kings, tell stories and fables to drive home their point, or wordplay in striking metaphors to mince their words. The dialogue instead is mostly functional, serving to carry the plot forward while trying its best to keep the characters true to what we know them to be. Some of the writing is even downright lazy, as was the case with Theon and a bunch of Iron Islanders rescuing Yara in a matter of minutes; it almost felt as if the showrunners wanted to be done with all remaining subplots whatsoever. On the whole, the season premiere was a good enough episode for the reason that it gave us new Game of Thrones material to ponder and dissect, almost one and a half years after we saw the last episode. The said, it leaves a lot to be desire in Game of Thrones parlance and still has a lot to wrap in its remaining five episodes. My biggest frustrations thus far is how little they’re doing with both Bran and the Night King; unarguably, these are two of the show’s most powerful characters but one is mostly silent and the other is the Three-Eyed Raven (seriously people, y’all need to talk to Bran a lot more) who occasionally doles out sage advice that ends up being ignored (his revelation about the Wight Dragon for instance). That said, the episode does end with Jaime’s arrival in Winterfell, only to horrifyingly find Bran Stark paralysed, but still alive in the final callback to the Season 1 premiere which itself ended with a scene between the two. Between that and the episode 2 preview, it’ll be interesting to see if things take a turn for the worse.